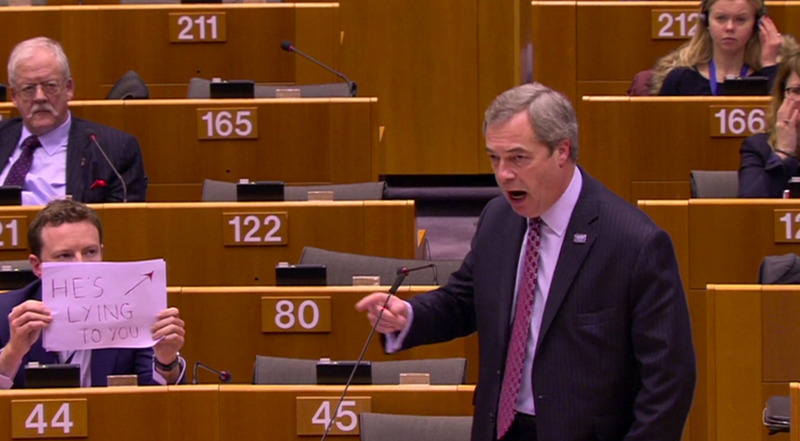 European Parliament TVSeb Dance mocks former UKIP leader Nigel Farage. Leading MEP Seb Dance calls on Labour MPs to “lead the conversation” and take a tougher stance against Brexit. The Labour MEP told BI that his Westminster colleagues need to stand up for what they believe in. Dance shot to fame after publicly mocking former UKIP leader Nigel Farage in the European Parliament. BRUSSELS, Belgium – Jeremy Corbyn’s Labour Party must “do the right thing” and take a much stronger stand against Theresa May’s hard Brexit plan, one of the party’s leading MEPs has warned. Seb Dance, who is Labour’s deputy leader in the European Parliament, shot to fame after holding up a sign reading “he’s lying to you” behind Nigel Farage in the European Parliament in February last year. The picture, which instantly went viral on social media, made Dance a poster-boy for anti-Brexit campaigners. 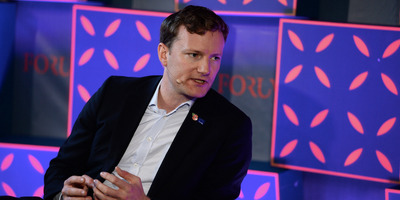 Now in an interview with Business Insider, Dance says the national party needs to take a similarly bold position and be honest with voters about the damage that pursuing a hard Brexit would risk. “I get what it’s like when constituents come to you and give you a point of view that you don’t agree with,” Dance said. “It’s tempting to sit there and nod your head and say you’ll sort it for them. But you’ve got to be honest with people. “We’ve seen the government’s assessment on what it would do for jobs in those areas. If MPs are telling people in those areas it’s all going to be ok, and they end up losing their jobs and with a worse state of living, are they going to go back to their MPs and say ‘thanks, that was great. At least we’ve got our sovereignty now’? Nonsense. He added: “MPs are elected to lead. If we don’t, we’ll end up in a situation where whatever Farage, The Daily Mail and The Daily Express says will become the UK’s direction of travel. MPs are elected to lead. If we don’t, we’ll end up in a situation where whatever Farage, The Daily Mail and The Daily Express says will become the UK’s direction of travel. Dance told BI that he had sympathy for Labour MPs representing pro-Brexit regions, but said they were elected to “lead the conversation” and carry out what Labour “believes” in. “I have massive sympathy. Of course, I get it. I talk to colleagues from Leave areas,” the MEP for London said. Dance’s comments come as pressure builds on Corbyn to back a softer Brexit position. The shadow Northern Ireland secretary Owen Smith has today called on Corbyn to back a second referendum on the terms of May’s Brexit deal. “Labour needs to do more than just back a soft Brexit or guarantee a soft border in Ireland,” Smith wrote in the Guardian on Friday. 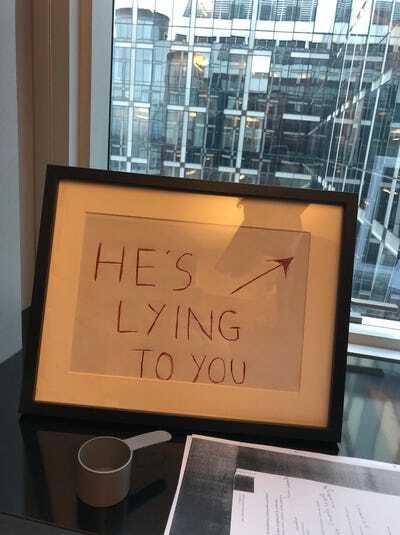 The sign Dance used to mock Farage last year is now framed and sits behind the Labour MEP’s desk. As we spoke, Dance spotted Farage on the television speaking to Sky News. “What the hell is he doing on TV?” he asked. Dance stresses though, that his anger isn’t just reserved for “nonsense” claims made by the former UKIP leader, but also for an “incredibly frustrating” ignorance among Westminster politicians towards what the EU actually is. “Westminster is all about having a conversation about ourselves to ourselves. It’s not that other colleagues here don’t have the same problem. German colleagues often complain about the Berlin bubble. “But there is a much, much better understanding of what the EU does in other member states,” he said. “We have got to wake up to our position in the world. We have incredible advantages. We speak the world’s language. We have a brilliant legal system. We are ideally placed for the next century,” he added. “But if we think we are bigger than we are, if we pretend that we can compete on the same level as China and the US, then we are delusional. “And not only are we delusional, but we are letting down the next generation because we are not preparing them for the challenges ahead. “The world is getting more and more global. Companies and individuals are going to have to compete with people in different jurisdictions and different cultures, and if we don’t understand those cultures and – and this is where freedom of movement comes in – we are going to be at a huge, huge disadvantage. Adam Payne / Business InsiderThe famous sign now framed in Seb Dance’s office. BI interviewed Dance in Brussels where the European Council has today approved the latest details of Britain’s Brexit Withdrawal Agreement, including a proposed 20-month transition period. “We shouldn’t be leaving like this,” he said. He believes the government has “no idea where we are going” once the transition period expires and is simply using the 20 months to further delay decisions on issues it has no solutions for, particularly the Irish border question. Option C is the EU’s suggestion that Northern Ireland could remain within the customs union and fully aligned to single market rules in order to avoid a hard border with the Republic. We’ll get to the end of transition and say ‘hey, we are nowhere near ready to end this’ and end up extending transition indefinitely. The UK government has insisted that it option C will not be required because an invisible border can be maintained either through a wide-ranging free trade deal (option A), or technical solutions (option B). Dance said option C – although recently described unacceptable by Prime Minister May – is the most likely option. He also rubbished suggestions that EU member states would be willing to accept minimal infrastructure on the Irish border in order to push through a final Brexit deal. The MEP predicted that Britain will remain in transition for years beyond the proposed 20-month timeframe. “We’ll never get out of transition in my view,” he said. “You’ll still have Rees-Mogg throwing things in the Thames and Farage saying it’s a betrayal. You’ll still have divide in the Tory party and questions about the Irish border.